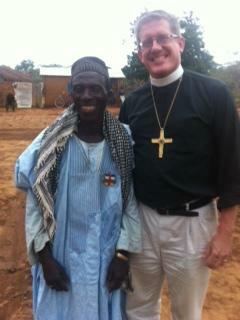 The most remote village we visited in the Central African Republic was a majority Christian village. Nearly all Lutheran. It took us two and a half hours from Baboua on deeply rutted unpaved one-lane roads. The village, like most, has no running water, sewer or power. The only church in the village is Lutheran, as was the case for the many villages we passed along the way. The pastor, who also has several other congregations, lives in Baboua, and comes to this church one Sunday a month, to lead worship, preside at their monthly communion service, do baptisms and attend meetings. The other Sundays an evangelist leads a service of Word and Song. The pastor also uses the motorcycle to transport seriously ill people to the Gallo Clinic. This is the village chief. He is a Muslim. He is a very happy man, deeply grateful, because the Lutherans are building a school in this remote village, to educate their children. Lutherans are starting schools in many places because the government cannot afford to. We were received like heroes. The entire village came out to greet us and sing songs. They killed a goat for us, something they can only do a couple times a year. Intestines and all. We ate dutifully. These people spent a month’s food expense on us, to show us their most lavish hospitality. I was humbled. This strikes me as a key component of a rapidly growing church. They are an absolutely indispensable component of the social fabric. They matter. These churches are far from being self-serving religious clubs, irrelevant to the community. They are rooted in the community. By the way, many of you are supporting this work. Your giving last year to “Village Education” in the Central African Republic is building schools this year. Your giving to motorcycles helps pastors do their work.